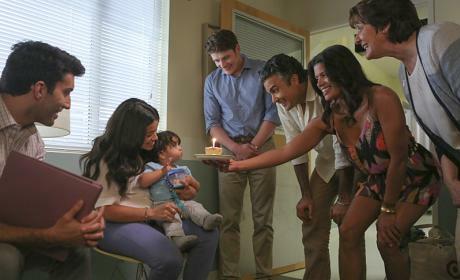 Today will be a special double recap of Jane the Virgin in preparation for the finale next week. Shall we get started? So last week's episode followed Jane and her feud with Petra. Jane got fired from her TA job because Anezca put the ad for her writing skills in the school posting. Jane suspected it was her, but upon confronting Petra, Petra denied it, feeling bitter towards Jane. Petra also tried to help Rafael in this episode with his Derek problems. Rafael, after moving ahead with his Fairwick deal, is threatened by his brother, saying he'd turn him into the police if he didn't sell him the Fairwick for a dollar. Rafael told Jane of his troubles, and Petra, upon hearing this, confronted him and gave him her idea. Michael spent his days working for Rogelio as the new technical adviser. At first, he's depressed that the job isn't going as expected, but he soon finds fun with it as he researches medieval history. Rogelio, on the other hand, does not enjoy his constant attention to detail and lets him know this but gives him hope that he will find another job that he loves. Rogelio also struggled a bit in this episode, dealing with his nemesis in a crossover of their telenovelas. (Who, by the way, slept with Xo, and I can sense some things are really going to get messed up.) He also struggled with his relationship with Dina, not feeling like it was committed enough, trying to impress her by appearing smarter than he was. Through it all, the mothers of the show were celebrated in a mother's day celebration put on by Petra where Rafael confided in Jane, Jane confided in Michael, Petra and Jane had a blowout, and Anezca passed out. Yup, that's Jane the Virgin for ya. But we did end the episode on a couple of cliffhangers. It was found out that Anezca can mimic Petra perfectly, and that Derek has in fact been working with his mom/Mutter the entire time. Moving forward, we follow Jane as she continues wedding and birthday plans. She is a bit stressed about it all when things start falling apart. Rogelio's crew is going on strike so they wouldn't be able to use the set for the wedding. Mateo's birthday entertainer falls through. And Rafael isn't listening to her about the Derek situation. On the bright side though, Abuela apparently got in contact with the VP of Simon and Schuster, who would be willing to take a look at her writing. So this is a bright side for Jane obviously, and I know this is a TV show, but VP's don't work with the writers--editors and literary agents do. And I also have a hard time believing the VP would read Jane's writing just because Abuela said it was good, but whatever. Also, the opportunity ends up falling through because after her adviser says her piece might need some work, she decides it does too. Anyway, Rogelio was pretty busy this episode too, working as a crew member in order to keep them from striking on Jane's wedding day. But after Telemasivo gets a crew to replace those who would strike, he decides to stick up for them, and unfortunately, the wedding cannot be held at the the house set. Rafael also struggled in this episode with the Derek stuff, and after relying on Petra and staging an F.B.I arrest that Derek eventually snuffs out, he gives him the Fairwick. Also, Michael suspects something is up with Derek and gets back in contact with Susana, only to find Mutter captured and Derek escaped at the end of the episode. But on a happy note, the Villanueva family is reunited in a small gathering at the hospital--Mateo was sick on his birthday :'(-- and they reflect back on the year they've had and how much everyone has grown. Also, it was strongly hinted Rafael still loves Jane. It took me a while to like Michael again, but through it all, my Rafael shipper heart has survived. What a predicament. Alright guys, next week is the last episode. Are you ready? Because I am.